Our students represent a wide range of ages and stages, from 6 year olds to people in their retirement years. Some are absolute beginners, some experienced players, and others are returning to music after many years. What will I learn to play? Each student’s programme is adaptable to their individual needs. Where there is prior experience, the teacher will consult with students / parents to establish an appropriate learning pathway. 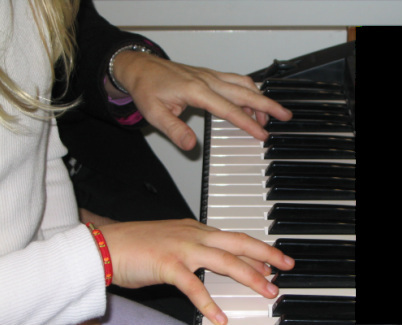 Keyboard / piano material varies according to both the age, preferences, and learning needs of the student. For most students, the pleasures of learning to play and discovering a whole new world of musical fun are enough. At Allegro we acknowledge each new stage of learning and celebrate the achievement of new skills, so students already have a clear framework which highlights their progress and provides goals for them to work towards. More advanced students who have demonstrated a high degree of commitment to learning may wish to prepare for Trinity Guildhall examinations. This option is only available to students who demonstrate the talent and work ethic required. Successful exam preparation requires a good standard of technical skill, concentration and attention to detail, as well as a considerable time allowance for practice. A suitable home practice instrument is essential, as well as an individual class each week, focused on exam requirements. Do I need an instrument at home? Home practice instruments are not required for Allegro group classes. However, having an instrument to play at home is fun, will reinforce learning and enhance progress, especially as students advance to more complex musical pieces. If you wish to purchase an instrument and require some guidance, please discuss the options with us. A suitable home practice instrument is essential for students taking individual examination classes.